Garlic butter makes the perfect topping for this sheet pan chicken recipe. Preheat oven to 375 degrees. Spray a rimmed half sheet pan with non-stick spray. Add the butter to a small mixing bowl with the garlic, onion powder, parsley, and salt. Stir well and set aside. Trim the ends of the green beans and place in a single layer on the sheet pan. Top with the chicken breasts. Sprinkle the chicken breasts with paprika and salt on each side. 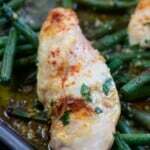 Pour the garlic butter evenly over the green beans and chicken.